Mark and I have just returned from 5 days in Charleston, SC, where his family lives. You know you like your in-laws when visiting them is your idea. Mark’s uncle, Jeff, is an avid gardener who owns two properties, both of which sprout delicious vegetables year-round. My dream is to one day live close enough to Jeff that he’s able to garden on my property, giving me rights to forage a salad from his plants every day. Many of us pitched in at dinner time while we were there, but Jeff and Mark’s aunt Joyce were able to provide fresh lettuce and other veggies plucked fresh from their gardens. It’s things like that that tempt me to submit to their hints that we should move down there from horrid, freezing Northern Virginia! Jeff is a big fan of Middle Eastern food and one night treated us to one of his favorite meals – one I’ve never had before – an Egyptian dish called foul mudammas (“foul” is pronounced “fool” and it’s far from foul). Per my request, he and Joyce shared a recipe they originally got from the internet and have been making frequently since then. Foul Mudammas is a peasant food: cheap, filling, delicious, often served as breakfast, and depending on how poor you are, possibly lunch and dinner. Although we had it for dinner, I can see its appeal as a savory breakfast, especially in the summer, its bright bite a lovely way to begin the day for those of us lacking the sweet tooth most American breakfasts appeal to. I think Jeff has made this dish so many times he operates on instinct now, but here is the original recipe he worked from. Warm the cooked fava beans and chick peas, then transfer them to a large bowl. Add the lemon juice, garlic, and salt and mash together until about half of the beans are broken down and the rest are still whole. Add the remaining ingredients and combine well. Serve with pita bread. 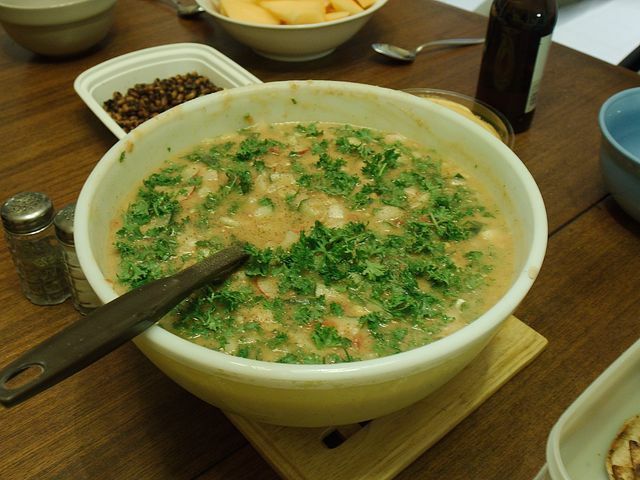 We served this with pita, hummus, sliced cantaloupe, tossed salad, and Joyce’s crunchy, spicy black-eyed peas, which I should have demanded a recipe for as well. Scrumptious! Have I mentioned that Mark’s entire family happily eats vegan whenever we’re around? Sometimes I forget that’s probably actually unusual, but they are people who frequently eat vegetarian and vegan anyway, so I know we aren’t putting them out. Still, I love it and I know I’m lucky. Mark’s mom never fails to find some new adventure for us to try while we are down there, with a heavy emphasis on nature, animals, and photo ops for my sake. Mark’s parents, aunt, uncle, and cousins moved to Charleston about six years ago, so it’s not like this is their hometown, but the more times we go down to visit, it’s probably getting harder and harder for my mother-in-law to find new places for us to go. I’d tell her not to worry so much about entertaining us except, well, I LOVE nature, animals, and photo ops. 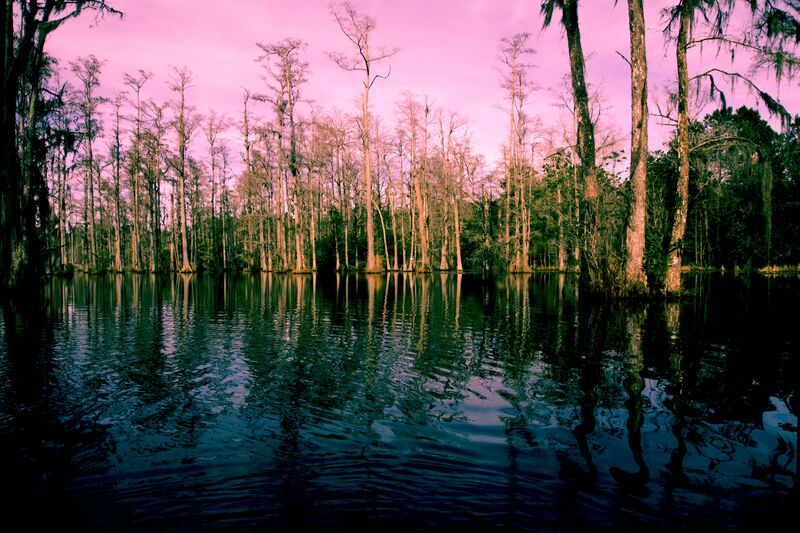 She outdid herself this time with Cypress Gardens, about 45 minutes north of the city of Charleston. Cypress Gardens has several attractions, including a lovely butterfly house that I loved, a very small aquarium which I hated (I do not like aquariums or zoos), and a black swamp which I loved, loved, loved. 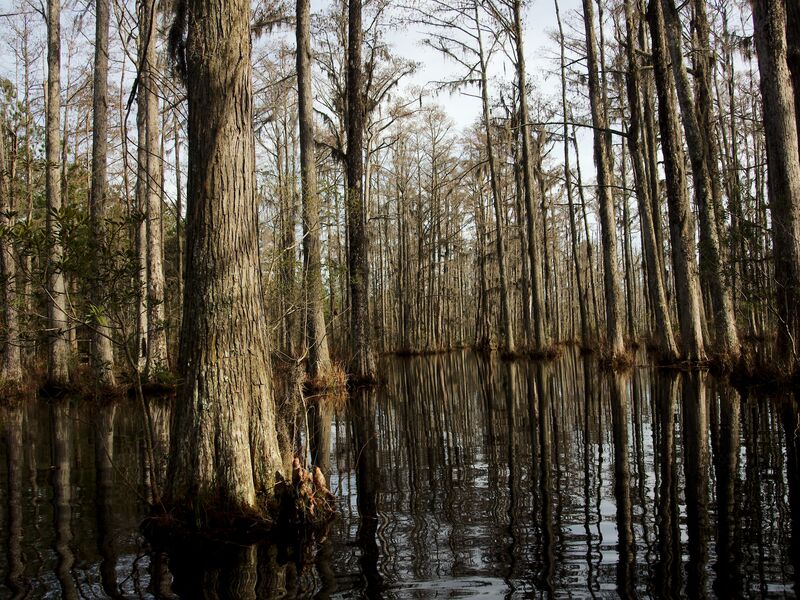 If you can get past the fact that there is an aquarium there, the swamp is TOTALLY worth the drive if you ever find yourself in the Charleston area. 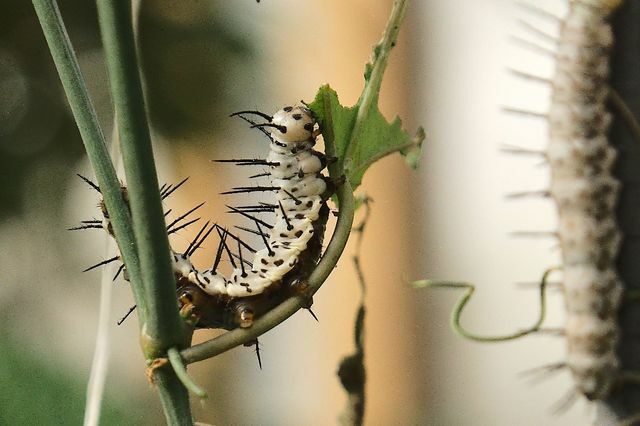 There were plenty of butterflies fluttering around the butterfly house and perhaps I’ll share some pictures in a later post, but today, how about instead a butterfly-to-be? They had to drag me out of the butterfly house, but only because I didn’t know how awesome the swamp was going to be. 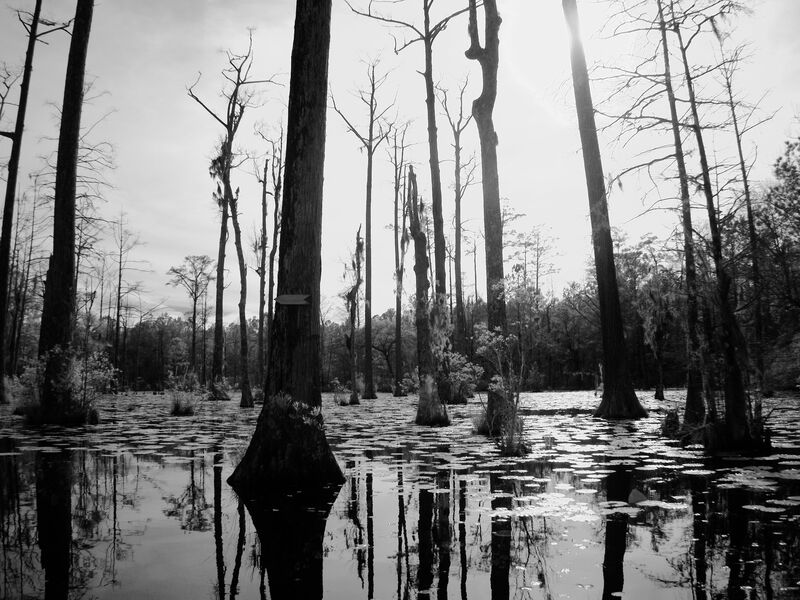 So, the swamp is black because the cypress trees leach tannins into the water. My mother saw my pictures and freaked out about the alligator (!!! yes! ), but until then it hadn’t occurred to me that some people might not find a combination of alligators, vultures, and black water to be the greatest experience ever, but I was in heaven. Almost literally: I commented it was like being in a dream. We were fortunate to be there on the one really nice day (out of a couple very cold and one rainy day): sunshine and 60’s – very beautiful – but really almost any weather is going to give you a variety of awesome photos, beautiful for different reasons. I’m itching to go back on a foggy, misty day. There is a walking trail around the swamp, but what you want to do is take one of the paddle boats for either a self-guided (included in the admission price) or guided (for an extra fee) tour. 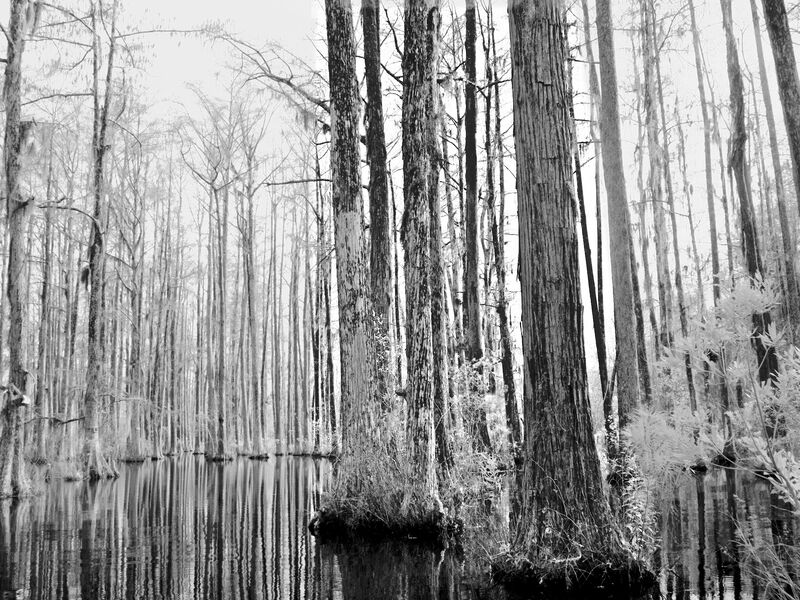 We paddled at a leisurely rate (or rather, Mark and his mom paddled at a leisurely rate while I sat in the middle seat and rapturously snapped hundreds of pictures), and it took about an hour to complete the loop around the swamp. The swamp pictures are best viewed in high-res, so the rest of the photos in this post are linked to big versions; just click on them for the full-size version. This photo has been color manipulated…because I finally found a RAW image editor for Linux I like so I celebrated with a pink sky. 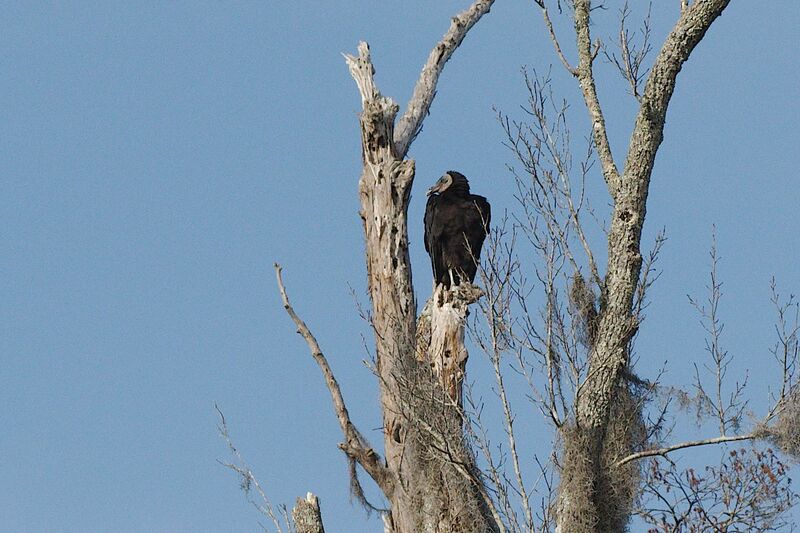 I was totally focused on how amazing the trees and black water were, but when I managed to look up, I found VULTURES! This involved a few demands to stop the boat so I could take pictures and generally rhapsodize. The water was very, very calm, with little visible life teeming around. 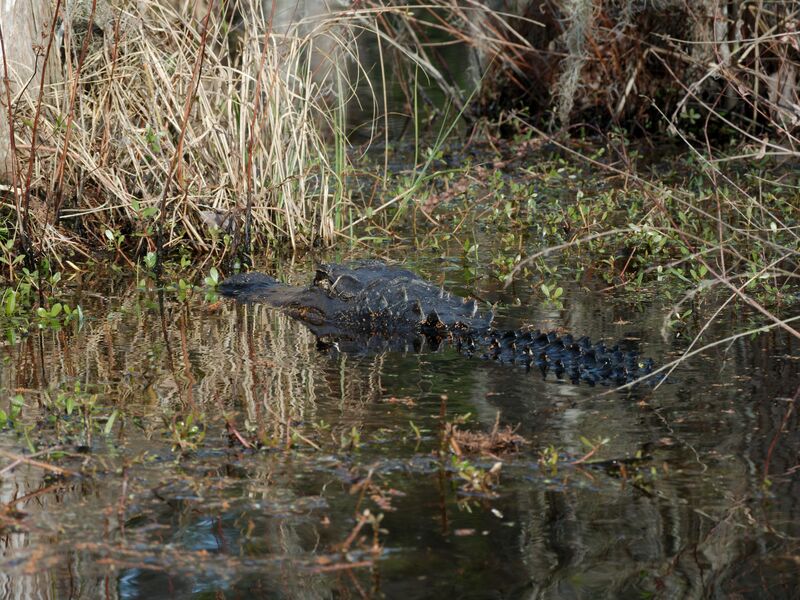 I saw a turtle or two sunning itself, but the greatest part was when Mark claimed he saw an alligator. Now, there was a sign where you get into the boats saying there may be alligators, and a wishful-thinking Renae even boldly exclaimed, “I sure HOPE there are alligators! !” as she stepped into the boat, but neither his mother nor I believed wolf-crying Mark when he cried alligator. Except he DID see an alligator and soon we did too!! We paddled right by him!! How awesome is that?? If you’ve been reading this blog for a while, you know what’s coming next: the infrared shots. Yes, the swamp, like a lot of South Carolina locations, lends itself very well to infrared photography. 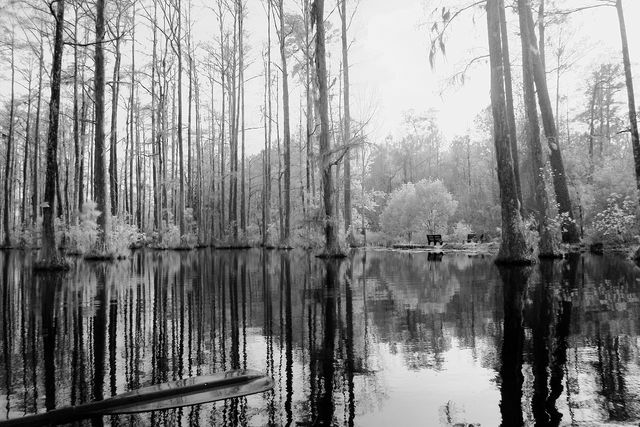 This one incorporates several elements: you can my mother-in-law’s paddle in the lower left, the super reflective water, and in the distance a couple of park benches framing the trail around the swamp. I chose to include this one because it shows one of the white arrows (on the tree in the middle; it’s hard to make out if you aren’t looking for it, but it’s the lighter-colored rectangle on the tree bark) that mark the route that you are supposed to row, although I then realized that if you look at the photo above this one, also on the middle-most tree, there is also a white arrow. 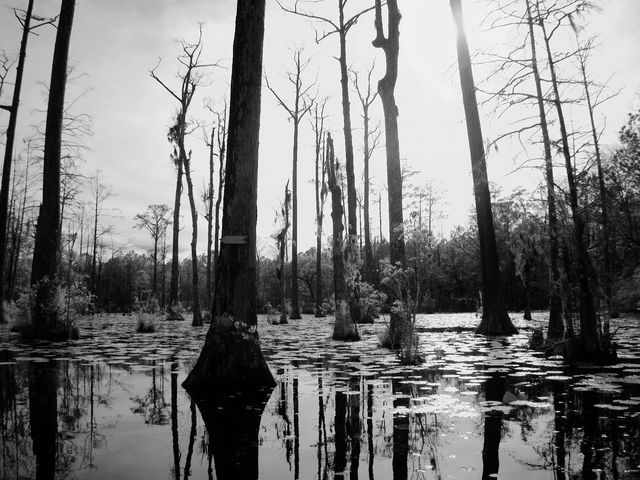 Because the swamp is a complex and fragile ecosystem, you don’t have free reign to row willy-nilly throughout the swamp: you are to follow the unobstrusive arrows through a set path. Fortunately, it’s a long, meandering, very interesting route, although you do have to go under a couple of low-clearance bridges, which I found to be part of the charm. 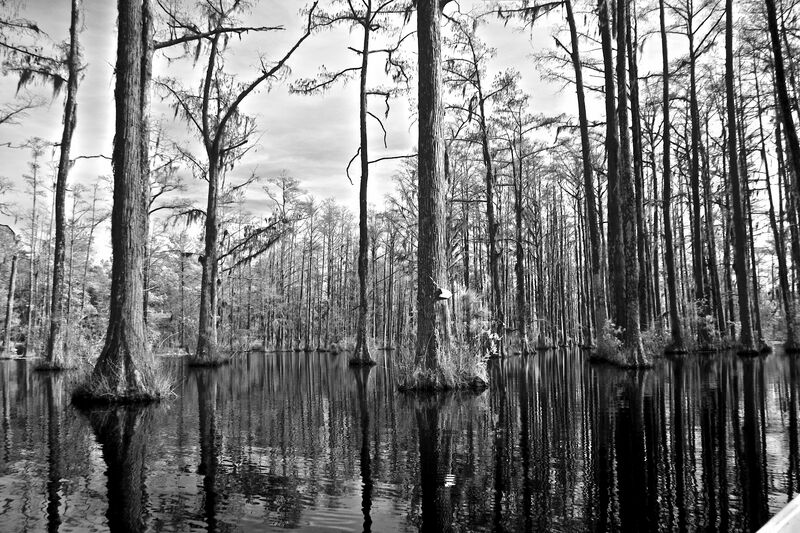 This one really emphasizes the reflectiveness of the black water and the dream-like quality. Who says I have to convert all my infrared pictures to B&W? 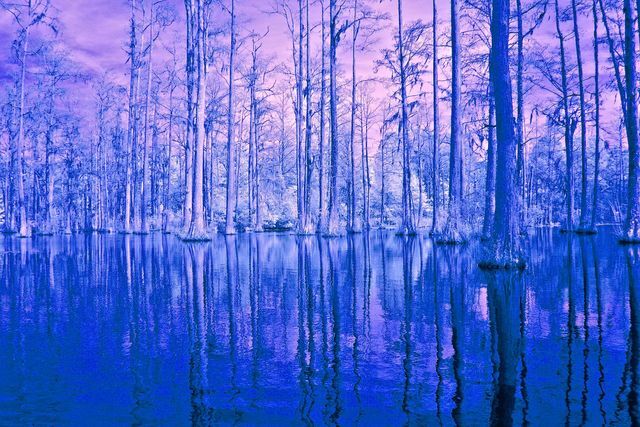 How about blue to convey the winter season? That’s all for tonight…I was going to show you a dog picture or two, but I think I’ll save those for next time. 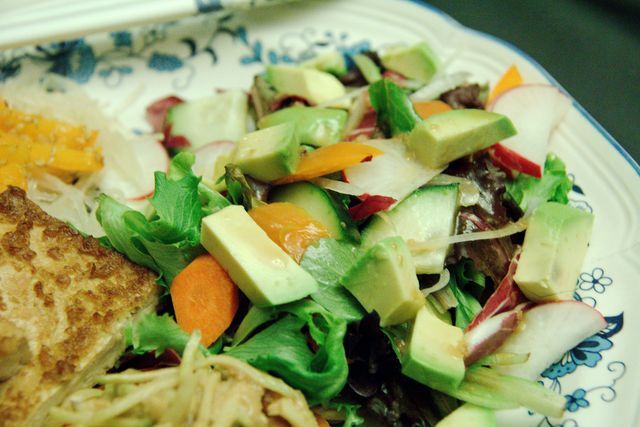 Asian Broccoli Slaw, Marinated Tofu, and Salad Dressing….and bats! In a small bowl, whisk together everything but the slaw. In a larger bowl, toss the dressing with the slaw and refrigerate for at least an hour for flavors to blend. 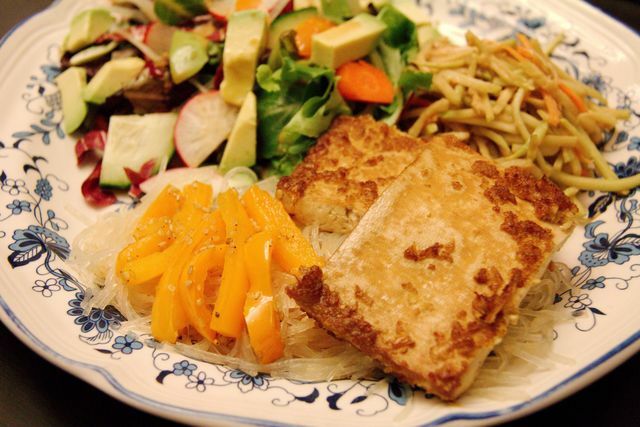 Whisk together everything but the tofu and set aside. 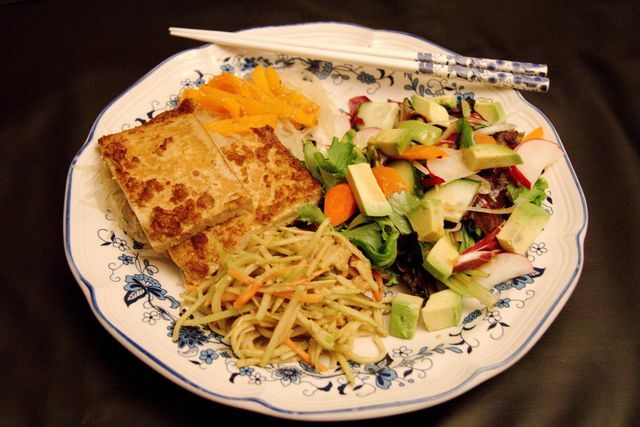 Slice the tofu into 1/2″ slabs and arrange in a 8″x8″ or 9″x9″ baking pan. Pour the marinade over the tofu and let marinate for at least half an hour. Meanwhile, preheat the oven to 375 degrees Fahrenheit. When ready to bake the tofu, pour off some of the marinade so that the tofu is about half-submerged. Bake for 30-40 minutes, until golden. I served this over some mung bean noodles, which I soaked in boiling water for 15 minutes (don’t keep it on the heat, just boil and set aside), then tossed with leftover tofu marinade. I also lightly stir-fried some julienned orange bell pepper in some sesame + toasted sesame oil, then tossed with toasted sesame seeds and served both the peppers and the tofu over the noodles. Whisk or shake together all ingredients. 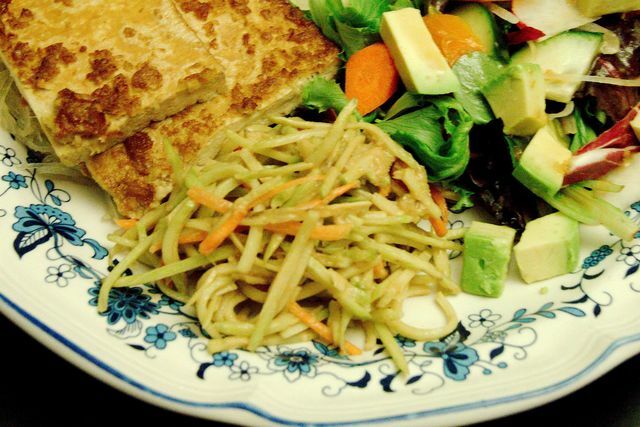 Serve over a green salad. In wildlife news, I have to take at least six hours of continuing education hours to renew my rehabbers permit every year. Last year I was so busy and there were so few classes held nearby at times I could go that I was cramming in readings at the last minute. This year I’ve scored all six hours within nine days of the permit year beginning. This I did by attending an all-day bat workshop yesterday. I was very excited about this because I’ve always had a particular love for bats and I intend to accept bats one day when I’m rehabbing out of my own home. It was a great, very informative class, although also kind of depressing because some of the species in our area (the Mid-Atlantic) are federally endangered, and many more are state-listed as threatened or endangered. 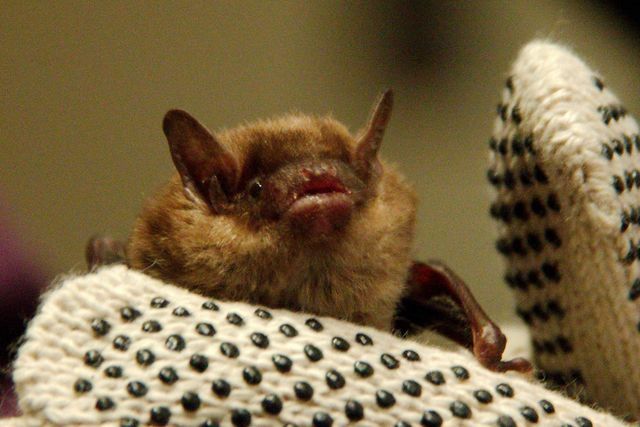 Even the most optimistic bat enthusiasts are very worried that the species suffering from White Nose Syndrome will be extinct in just a few years. This is very bad. 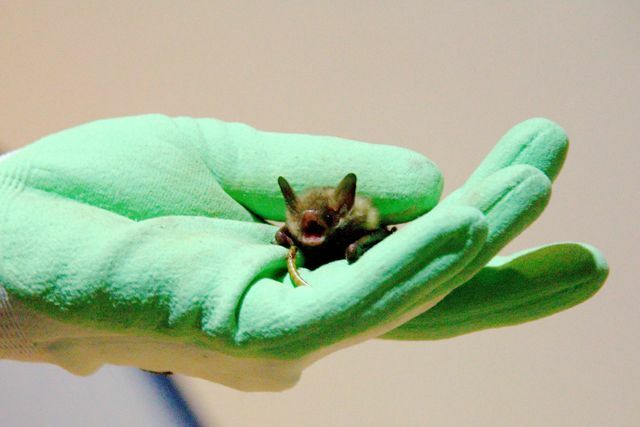 Although so far the fungus affects only those bats that hibernate, migratory bats are being killed by wind turbines, so there’s unprecedented death rates for all kinds of bats. Bats eat their weight in insects every night. You don’t want to live in a world without bats. I can even relate the wildlife portion of this post to food for once, because one of the consequences of extinct bats is going to be crop failures, greatly increased food prices, and/or higher instances of pesticide use. I was able to take some pictures of the live bats. (Because I’m rabies vaccinated, I was also able to handle the live (and dead) bats, which even more exciting!) Unfortunately I think I’m going to have to retire the crappy “all-purpose” lens I tend to leave on my camera as a default because the pictures S.U.C.K. and I’m super disappointed by them. True, the lighting in the room was dim and terrible (though probably a lot more bat-friendly than camera-friendly), but I still think I could have gotten decent pictures with a better lens, including some I left at home. Live and learn, I guess. So I apologize for the horrible, horrible, horrible pictures, which don’t do any justice to these awesome little creatures, but bats are too cool for me not to share and I feel compelled to raise awareness of White Nose Syndrome. As of right now, it’s confined to the eastern and more northern parts of Northern America, but it WILL soon migrate to the south and west, and it’s devastating. This is a Big Brown Bat. 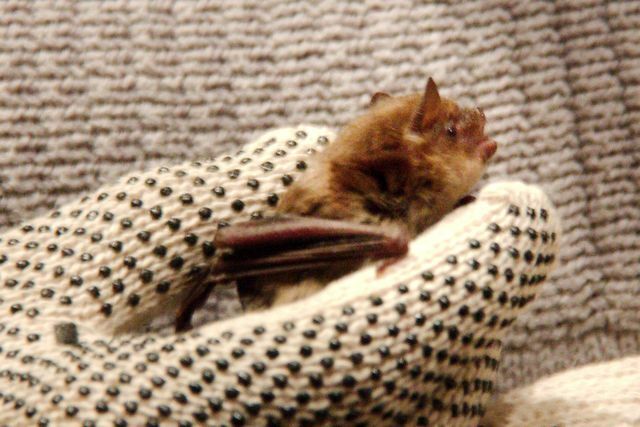 Big Browns are a migratory species not affected by White Nose, unlike the similar-looking but smaller cave-dwelling Little Brown Bat. 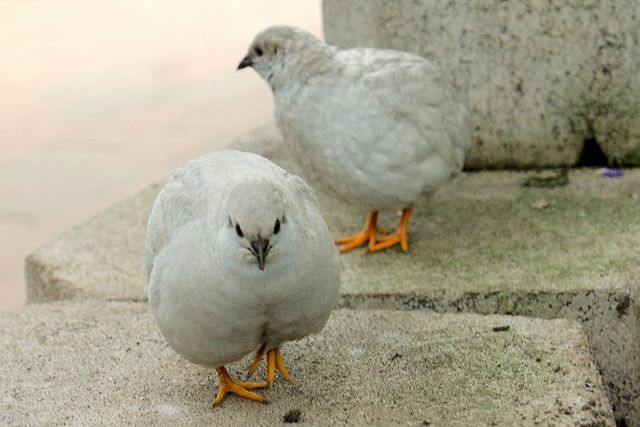 One kind of good thing is new Big Brown colonies have been found in areas where Little Brown colonies have been wiped out by White Nose, so nature is replacing one species for another. 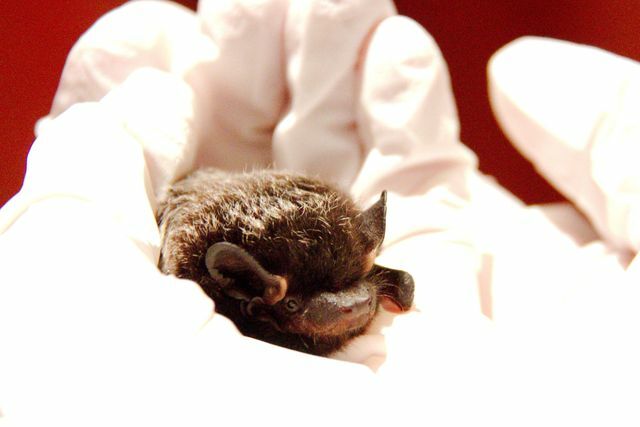 Note that despite the name – and he is in fact bigger than a Little Brown Bat – like all North American bats, he’s really quite small. I was actually surprised by how tiny all of our bats are. They’re not at all like the beautiful, wonderful flying foxes I saw in Australia. Silver-haired Bat. I think he looks like a teeny-tiny, legless bull.